Kevan Jon Tux one shoulder serpent jacquard ball dress. Features tuxedo style satin collar around the one shoulder top with full sleeve. Exposed black zip from under arm across front to split at other side. Fabric is jacquard black raised snake effect. Hollywood meets chic masculine tailoring…. for you next formal or black tie event. Kevan Jon Tux one shoulder serpent jaquard ball dress. Smart tailoring meets Hollywood glam in this gorgeous formal, prom or black tie dress. The tuxedo effect on the one shoulder dress is a satin collar that edges around the top. The dress has a full length sleeve on one side and an exposed zip that works from opposite side under the arm and across the front to a split at the other side. This zip has ruched pleating giving a great shape to the hips as it travels along the body. 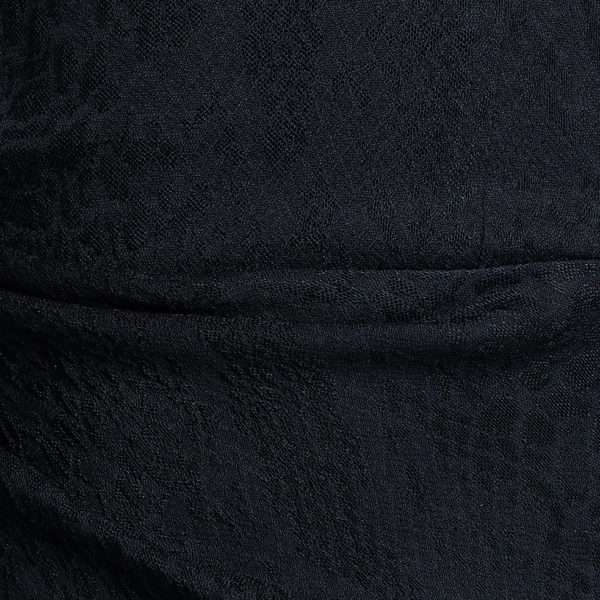 The fabric is a luxurious black jacquard with a raised effect of snake print.